Take flight. We own the sky. No fantasy is too weird. Little boy takes flight on his paper aeroplane, “Paper plane paper plane, take me to the clouds.” Along the journey, he meets new friends who want to fly too but are challenged by disapproving voices. 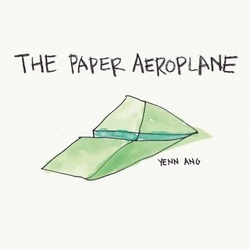 Little boy goes ahead with the journey, sadly, there comes a time when paper plane can no longer fly. . . . . .
Handwritten and illustrated by Yenn.